“A little folding of the hands to rest…” | Pursuing "enough"
Technically, the verse doesn’t exactly fit. Every Monday morning, though, as I begin to pick up and try to help our home recover from the weekend, I think of this verse. A couple of days off, I think. Just a couple of days where I didn’t do (fill-in-the-blank) and now look at this mess. Each time a Saturday rolls around, I feel like slacking a bit (it’s the weekend, after all), and then Sunday comes, with the get-ready-and-get-out-the-door morning crunch, when things get left undone or half-done… And then it’s another Monday morning, where I look around and shake my head and wonder, how did this happen? Oh, yeah… a little folding of the hands to rest. Our problem isn’t scarcity or poverty…it’s just “stuff,” stuff that gets piled on any available flat surface “for now,” somehow leaving me to deal with it each Monday morning. Our lack of routine come Friday night is screamingly apparent by Monday morning; any other day of the week I’d be on top of all this, but apparently the weekends are “playtime” and not “worktime” around here. I’m not a huge photo-blog person; the only other photo I’ve included so far was for a guest post I wrote, whose site always used photos. But I had to include a picture with this. 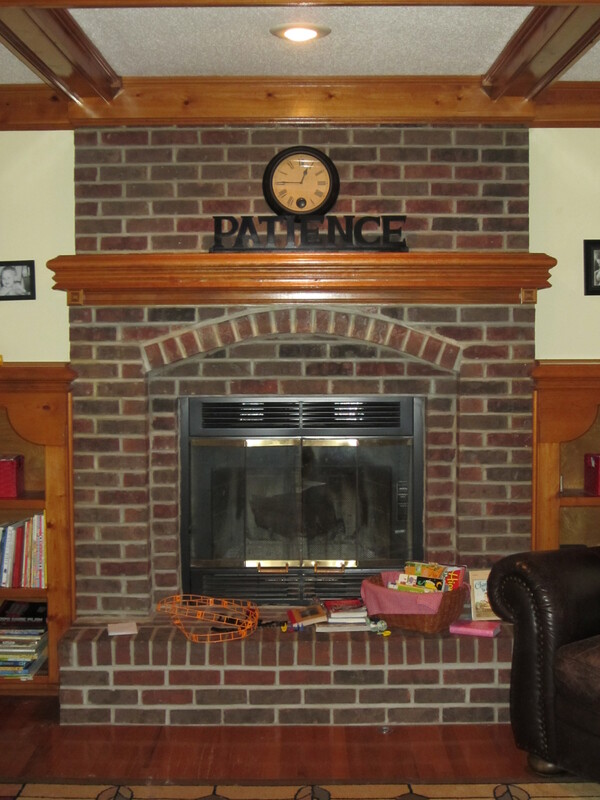 On the raised hearth of our fireplace sits a basket for library books. Most of the time, that is the only thing sitting on the hearth (although an assortment of things might end up in the basket). Every Monday morning, though, I come downstairs and realize that “stuff” has been sneakily accumulating over the weekend. Maybe it’s time to rest a bit less on the weekends…..